After a weekend of skiing Colorado’s Rocky Mountains the only thing on my mind is procuring a bowl of amazing pho. Luckily for me, Southwest Denver is home to one of the nation’s most prominent Vietnamese districts with authentic restaurants lining the neighborhoods streets. Good pho (pronounced fa) can be hard to find. 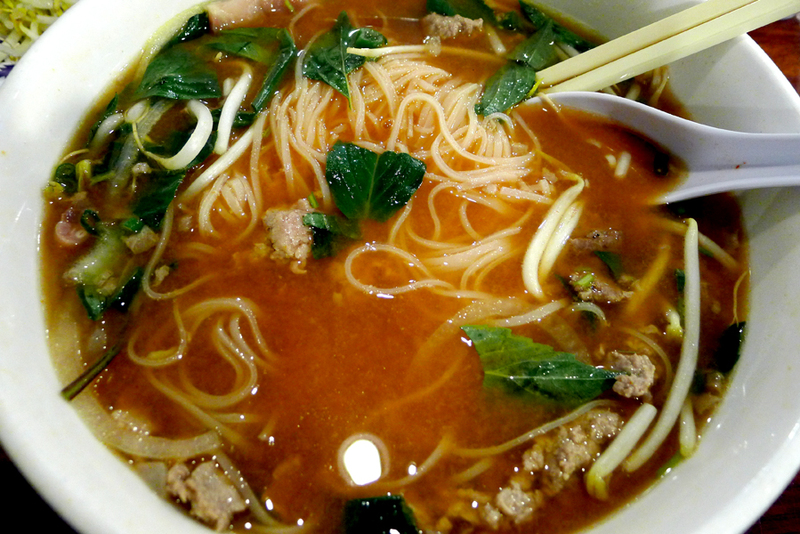 Often the broth is too watery or salty, the meat chewy and noodles overwhelming. Often restaurants give diners a measly few bean sprouts and thai basil to toss in. Not the case at Pho 95. Pho 95 is perhaps, and in my humble opinion, the best of Denver’s Vietnamese joints. I think the restaurant may actually be one of the top reasons I make my ski pilgrimage out West each year. The rich broth, tender meat and supple noodles are the perfect end to a weekend spent on the slopes. Icing on the cake, the staff there gives every table a heaping pile of the aforementioned soup additions. The pho itself is prepared in numerous ways. Options include various beef, chicken and vegetarian adaptations with a myriad of possible add-ins. My favorite is the marinated rare steak and tendon version. Toss in some fresh hoisin and siracha and you’ve got yourself the perfect bowl of soup. While the pho is the main reason to make the trek out to Pho 95, the other dishes are executed with sublime precision as well. Sunday supper here is the perfect end to a wintery weekend.